The raison d'être of investment or wealth management is to maintain, or hopefully improve, one's standard of living, i.e. to earn a real return on the investment amount. This sounds easy enough if one considers that the S&P 500 Composite Index (and its predecessors) delivered a nominal return of 9.1% per annum from January 1871 to May 2008. With an average inflation rate of 2.2% per annum over the period, this meant a real return of 6.9% per annum. These figures may not particularly appeal to many of today's market participants with their gun-slinging approach. I am deliberately refraining from using the word “investors” and can hear these people arguing that much better returns can be generated by “playing” the market cycles. Ah, the art of market timing! Perhaps, but keep in mind that very few people have succeeded in consistently outperforming the market over any extended period of time, especially once costs and taxes are factored in. More compelling proof that the odds are stacked against the capital-growth-only brigade is gleaned from an analysis of the components of the total return figures. Let's go back to the total nominal return of 9.1% per annum and see how that was made up. We already know that 2.2% per annum came from inflation. Real capital growth (i.e. price movements net of inflation) added another 2.1% per annum. Where did the rest of the return come from? Wait for it, dividends – yes, boring dividends, slavishly reinvested year after year, contributed 4.7% per annum. This represents more than half the total return over time! And for good measure, here are the numbers summarized in table format. In an environment characterized by increasingly shorter investment horizons, the concept of compounding sounds so yesteryear, but who can argue with the body of empirical market evidence? To coin a phrase often quoted, but seldom fully appreciated (or understood): It is time in the market, and not market timing that counts. You misrepresent in two ways. 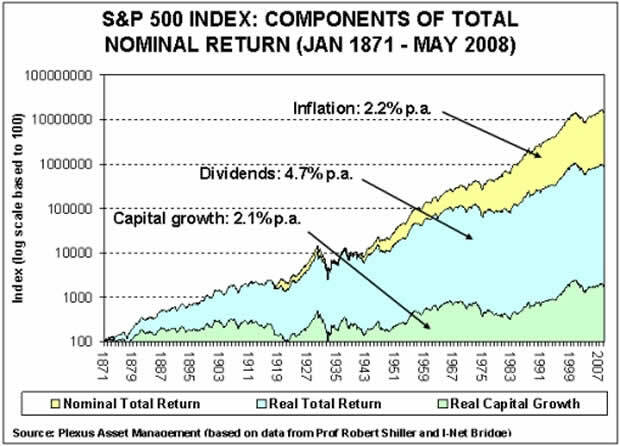 The second is your calculation of the 'real' returns from capital appreciation vs the return from dividends. Inflation's effects were subtracted from ONLY the capital appreciation. Thereby leaving the impression that dividend returns are much larger. Inflation hits all income from all sources.